I always wanted to know how to make cakes from scratch; I have spent my entire life doing so. After learning to make cookies, cakes were next on my list to learn. Way back when I was a child, I loved good cakes; even more than pies or other desserts. Unlike most people I knew, I was not partial to chocolate cakes but I loved white, angel food or even yellow was just as satisfying to me. Of course, I like them with good frosting too. I have tried for years to learn how to make white cakes from scratch and perfecting it. You might think this would be easy since it is such a basic cake. Quite the opposite, this has been the hardest chore I have had when it comes to food. There are many recipes in the books, magazines and everywhere for white vanilla cake recipes. Most of the ones which I have tried have turned out to heavy and dry. On occasion they were too light and flavorless, too much like a box cake mix. When you are learning how to make cakes from scratch the first thing is they must look right especially the white cakes. Whether it is baked in an oblong pan or in layer pans, it should be without cracks, bumps or depressions. You want the crust to be a very light golden in color so it covers well when applying the frosting, especially if it also is white. When you cut into the perfect cake, you want it to be a pretty white color with a velvety texture. It should be light and moist; not so dry that it crumbles when cutting a piece. Most of all it must taste delicious! 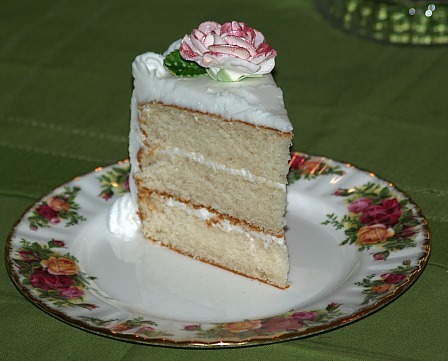 Many people do not like a white vanilla cake recipe simply because they never have eaten a good one. To me, there is nothing better than a tasty white vanilla cake recipe. The taste of cakes from scratch is the result of the best ingredients being blended with the correct mixing techniques. Although you can adjust the taste of a white cake with various extracts and flavorings, I always use vanilla in mine; I love a good vanilla flavor. I have learned over my many years to place a lot of importance on the type of vanilla which I use. There is a huge difference in the brand of vanilla which you choose to use in all your desserts especially the one for vanilla cake. Many of the vanillas really have no flavor. Even if you think the smell is good when opening the bottle, any flavor seems to disappear. For years I used what was conveniently placed on the grocery shelves. After years of disappointment in making cakes from scratch, I decided to try others which I found in specialty stores. There are many brands of vanilla on the market but I have never found a good one in the supermarkets. The one which I am using and am able to purchase consistently is called “Danncy”. I do not know if it is available everywhere but there are others. You will know a good brand as soon as you use it; that is how different the taste is. Try experimenting with small bottles until you find one you like. Making cakes from scratch is a game which must be played by the rules. When someone recommends a good recipe to you, do not try to change or cheat on the ingredients. Follow the recipe exactly. After trying it, if you want to change something to suit your taste then that is up to you but stick to the recipe first. With some cakes like a recipe for a white cake, if you try to take a shortcut and not sift the flour correctly, you will be disappointed with the results. Try my experiment by measuring out 1 cup of flour; then sift and measure again. You almost always have more flour after sifting. This additional flour may be the cause of a coarse textured cake with a cracked top and tough crust. If you are spending the money and time in baking something, it doesn’t pay to be lazy or try short cuts. You also must be careful about substituting ingredients when making cakes from scratch. Usually when a good recipe specifies an ingredient, there is a reason for it. For instance, if you are making a white cake and you decide to use butter rather than a solid white shortening, you will not get a pretty snow white cake but one with a tint to it and the texture will be slightly different. Also, it is important what quality of shortening is used. Many “cheap” shortenings are not really a good buy. The flavor is sometimes stronger than the better quality “more expensive” brands resulting in poor quality baking and money loss. Use fresh good quality eggs. Most recipes are made for using large eggs. It is important that the eggs are fresh. I had this problem recently when trying to beat the egg whites. They just would not whip properly; I tracked the eggs and found they were simply too old. Do not try to use the whole eggs in the cake when it tells you only to use the whites. Again, you will end up with one which has a yellow tint, but also the texture will be heavier from the yolks. Recipes for cakes from scratch often have liquids in them; this could be water, milk, buttermilk or evaporated milk. Do not substitute one for the other. There are substitutions which you can use by mixing ingredients but it is not switching one of these milks for the other. The correct pan size as directed by the recipe is important. Usually the white vanilla cake recipes can easily be switched from layer pans to a 9X 13 inch pan. Remember when the pan is being changed the baking time will need to be adjusted. Most of the time the recipes will also instruct you as how to prepare the pans. When they say grease, I almost always use solid white shortening. The only thing I do differently from most recipes is that I generally line my cake pans with wax paper; after greasing, I then grease and flour the pans. This process assures me that the cake will come out of the pans very nicely. When baking the cake in one pan, place it in the center of the oven where the heat is distributed evenly. If more than one pan is used, place so they do not touch each other or touch the walls of the oven. The oven should be preheated to the desired temperature before the cake is ready to put in the oven. Only for special cakes will the recipe instruct you to place the cake in a cold oven to begin with. 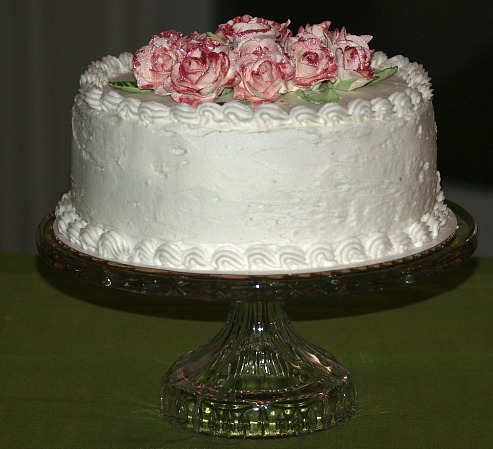 This makes a great birthday cake recipe or multiply the recipe to make a wedding cake. I add a touch of lemon plus vanilla to make a great flavor. Make sure you sift the flour according to the directions; shortcuts change the texture. Measure sifted flour; add baking powder, sift three times and set aside. Combine salt, cream of tartar and egg whites; beat until stiff peaks form and set aside. Cream sugar and shortening until light. Add flour mixture alternately with milk to the creamed mixture while mixing. Add lemon extract and vanilla to mixture and blend well. Fold in beaten egg whites; spoon into 3 prepared pans. Bake about 25 minutes or until pick comes out clean; frost with favorite icing. Although this cakes from scratch is called “silver”, it is simply an easy white cake made with butter and has a very good flavor. Preheat oven to 350F degrees; Grease and flour 3 8 inch round pans. Sift flour and then measure; add baking powder and sift several times. Cream butter and sugar until fluffy; add vanilla. Add flour mixture alternately with milk to the creamed mixture; blend well. Fold beaten egg whites into batter; spread evenly into prepared pans. I love cakes from scratch with sour cream. Although it is not perfectly “white” due to the eggs, it is a great moist layer cake with vanilla flavor. This cake is delicious with the pineapple filling (below) between the layers and frosted with whipped cream or seven minute frosting. Preheat oven to 350F degrees; grease and flour 3 round cake pans (9 inch). Measure sifted flour; add baking powder, soda and salt and sift 2 more times. Beat eggs until light; gradually add sugar and beat until well mixed. Beat in the sour cream; add flour blending well. Divide batter evenly among the prepared pans; bake until pick comes out clean about 25 minutes. Combine 2 cups shredded pineapple and juice, ½ cup of sugar and 1 tablespoon lemon juice in a saucepan. Cook mixture over medium heat until thickened. Let the mixture cool and spread it between the layers of the cakes from scratch. Frost sides and top with your favorite white icing or sweetened whipped cream.